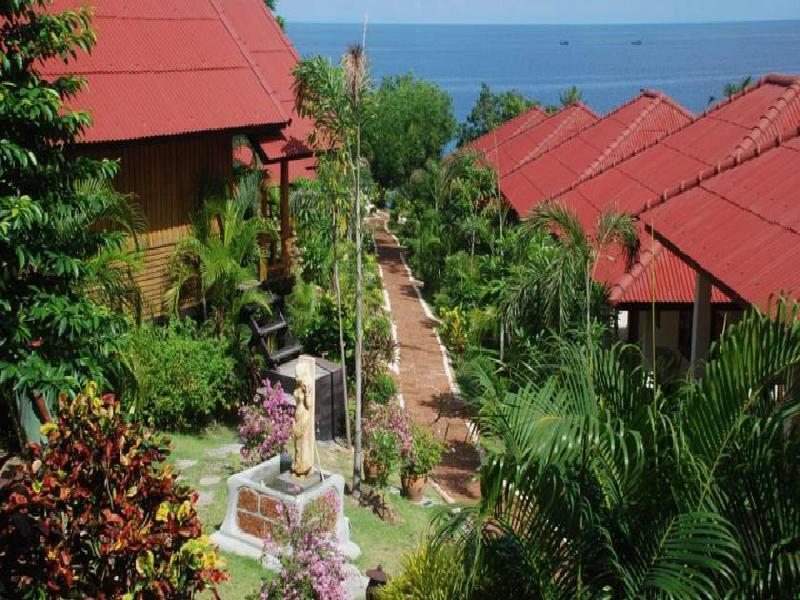 The resort is isolated from the main road, the staff is pleasant, helpful and responsive. The small beach provides privacy. We had a nice comfortable stay at Bounty! For the price the room was good, bit of a pongy toilet as no ventilation other than a mosquito net covering a window. Bed was reasonably comfy, but had little room around It as the bungalow was small. Nicest bit was the balcony/door area with hammock, chairs and a line to hang up wet swimming gear from the days of beaching activities! West coast is very nice for sunset, the private beach is small but intimate if that's your kinda thing! Bike hire is easily accessed and is advised to get around to explore I.e Koh Ma, Thong Sala, Hat Rin. As taxis are very expensive! we only tried restaurant once and food we had was good. However our main problems were the Wifi as it was very slow in our bungalow, but if you sat in the main nice seating area you'd get reasonable speed, the lack of cleaning as they only make the bed and sweep the room once every two days but did chang your towels everyday when you bring the towels to them to exchange. Would stay here again, owners are friendly perhaps offer a bit more advice and info about the area. We planned on staying for only 3 nights but extended it for a whole week. We loved the location with its own private beach and their own pool. The bed and pillows were comfortable, and the sheets and towels smelled nice and clean. Our bungalow included a hammock which I enjoyed to relax on while outside. The wifi is great enough to watch movies on because they have 4 different wifis to sign on to. Their food is delicious and conveniently located, since restaurant locations are more sparse in the north-west. I would just recommend reducing the price of their rice. Overall, we felt welcomed and loved being greeted with a happy smile at every time of the day. Nice and quiet, private beach, staff are so nice and helpful! Great stay at bounty. Our room was $15 for the night, what a steal. The bungalow is so cute and was nice and quiet with a very comfortable bed! Each bungalow also has a relaxing hammock. The hotel also has a pool and it's own private beach. This is not a budget hotel as it also has nice suites- we opted for the cheap bungalow option however. The food was delicious and cheap for a hotel- such a range! The staff are the nicest people ever and were so helpful and accommodating. So worth it and such a steal of a price! we booked the cheapest wooden fan room, set in lovely gardens. The room was basic, but we expected that for less then £7 per night. the resort has lovely, well cared for gardens and a lovely refreshing pool, the staff working there are friendly. We are a travelling family of 3, our son is 7 and we don't want to stay anywhere to rowdy, but this place was dead, it really lacked atmosphere, they could easily turn part of the building over looking the pool into a bar area that could have some music playing or something just for a bit of life, we stayed for 7 nights and it was fine. It would probably be perfect for recouping clubbers who have been out partying for a couple of nights peace and quite, but other then that its probably too dull, a shame as the resort is clean and staff friendly. Bounty Resort is a beautiful place to chill. The bungalows are clean and the view is great. The restaurant serves good food and the sandy, white beach is not far away. Hello We stayed at the Bounty Resort with 3 People for 3 nights. It was fullmoon-party time. They have an own little beach that is sorrounded by rock walls. Like a private cove. You can sleep in Bungalows with fan or you choose the aircon option that is quite a bit more expensive, though. It took us about 15 min. to get to the city at the south-west end of Koh Phangan, by scooter. The food was good and a lot to choose from, but certainly more expensive than when you go and find a place outside. I stayed in a standard fan room, no hot shower. The room is big and clean, so were the shower. Swimming pool was nice and there is a small beach. The best thing about this hotel is how easy it is to get to Haad Yao, just a walk away through High Life Bungalow. Internet is fast, but it is not accessible during the night. Unfortunately, the walls are thin and you can hear almost everything that is going on outside. Overall, a good stay. Huge bed. Nice pool. On the beach. Great stay here. Didn't really get full advantage due to staying one night for the full moon party. But this place was great. Nice and clean. Nice food. Great service. The bungalow was not like the description (no TV and no AC in the room) and not very clean. The staff is not very nice. The restaurant is not that good. I would recommand to book another hotel, cheaper and nicer. let me preface this review by saying i'm a backpacker that has been around the world and have stayed at some not-so-nice places. i don't need much in the way of services, but i believe the staff make or break a place. i've never been motivated to write a review until now. that should tell you how awful my time here was. although the hotel rooms were adequate for se asia (yet definitely not worth the agoda price. i was charged $45 for a hotel room, yes, dollars! while i met guests staying there in private bungalows for $12) but the services promised on the website were not true. there was no wifi, tv, or fridge. my shower dripped, pipes in the sink leaked onto the floor, and i had to buy toilet paper from them (none provided). i will say that the pool and private beach were nice although a bit far from the rest of town. however, the staff was so rude to me and made my entire stay there a hostel one where i avoided passing reception at all times. don't waste your time or money here. my friends stayed further down in a much nicer bungalow for 400 baht and the staff were so friendly and helpful there, it was great. We stayed here while the full moon party was on and whilst 30mins away its no troublle going to and from the Haad Rin area by taxi/truck. The area Bounty is in itself is really nice with the main beach one of the best on the island and a small private beach which is OK too because nobody is there. The rooms are quite basic but they have shower and fan to escape the heat. The mozzie nets worked perfect and no trouble was had with bugs. The views from the bungalows are quite nice and the resort has a nice feel to it with the relaxed atmosphere. Staff were generally unpleasant. The room we originally booked was dirty and smelled so we asked to move or have it cleaned and they insisted we pay more than twice the price to upgrade (which we reluctantly did as it was peak season and didn't want to deal with trying to find somewhere else). The next room was nicer with a view but still not overly clean. The lady at the front desk insisted it was cheaper to have our laundry done there as they weigh it dry after it has been washed so we did... when we got our clothes back the next day all our whites were pink which they refused to take any responsibility for. This was my third time to Koh Phangan but the first time I have been genuinely disgusted at a "resort". Also the wifi only works by the front desk and only between office hours. The food and staff are fantastic! If you are travelling on a budget and want a nice quiet place with easy access to a beach and snorkelling are, this is your place! Run very "mom and pop" style, the staff are always willing to make your stay a happy one! Rooms are nothing special, but you won't be in your room all that much! I think the average guest age was 450 yrs old, so, not really a wild part place! I will say not a lot for small kids to do,(small pool)but the High Life Resort next door let us use their pool when we went there to eat. Ko Phangan is beautiful! It hasn`t been spoiled with all the neon of Phuket, even with the full moon party taking place there. 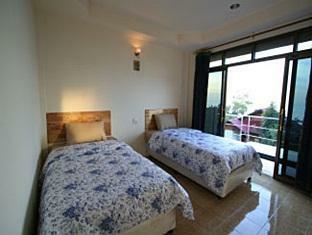 situated on the hill, so not so much mosquitos, it is quiet place ideal for family with children. clean, good food. Very isolated spot, not easy to visit other resorts. The pool was nice, and good thing as their "beach" was small dirty and unkempt. The railing leading down the steep steps to the beach is falling a part. They do not supply any type of beach chair or umbrella. In our room, the plumbing wasn't attached to the sink , so what ever went down the sink ended up on the floor and all over your feet. There were cockroaches in our room. Staff was unfriendly and rude. Had a hell of a time getting our money back when we realized they had been charging us wrong for breakfast. Don't go to Bounty!